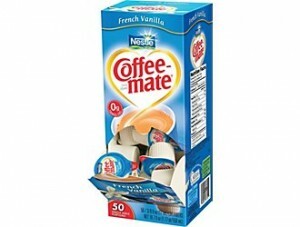 Head over to Staples and add a box of Coffee-Mate® Non-Dairy Liquid Coffee Creamers, French Vanilla, 50/Box to your cart. Use coupon code 69486 at checkout and ask for free shipping to store to get this for FREE! Hurry – this won’t last long! For some reason I couldn’t get the order to go through over the internet so I called Staples and placed my order over the phone. If you have this same problem you may want phone in your order. The phone number for Staples is 1-800-782-7537.